Putting in a new swimming pool is a great way to get more enjoyment out of your summer. You'll have the convenience of a pool in your own backyard, which means you can play, lounge, and cool off whenever the desire strikes. Many people, however, avoid putting in a swimming pool because of the associated cost. Are you considering putting in an above-ground swimming pool and wondering how much it really costs? There are several ways that building your own swimming pool can help you save money while still allowing you to enjoy all the comforts of your own backyard retreat. Before you put in your pool, you need a place to put it: a solid stretch of level ground where there are no tree roots sticking out of the ground or bumpy spots that will make your pool less comfortable. You will not want your pool to be uneven! The more landscaping is required, the more expensive your pool project may be. For example, if you need to excavate and remove debris from a rocky terrain you could spend upwards of $2,000 to level out a yard like this. However, most yard landscaping can be a simple DIY project if cleared of stumps and rock. 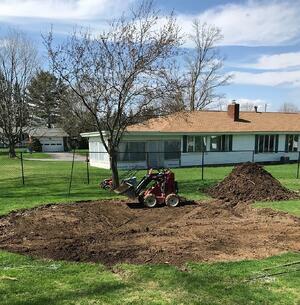 This could keep your landscaping cost easily between $0-$500 (depending on if you need to rent any equipment). Now that your yard is clear, how much space do you have for your pool? 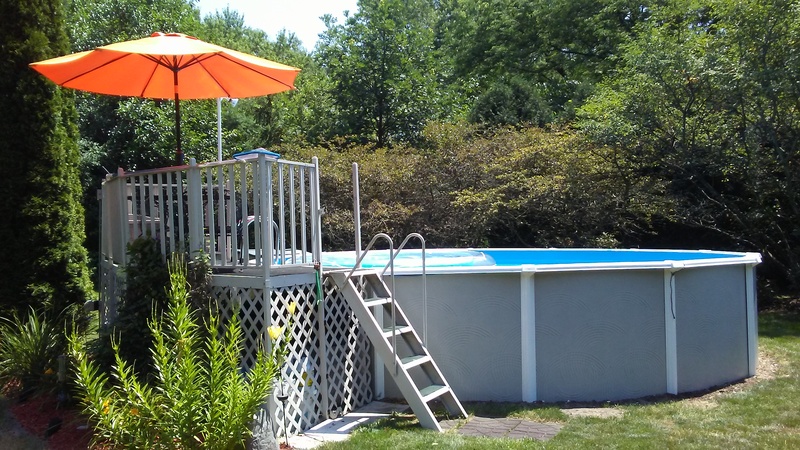 Above ground pool cost increases with the size of your pool. 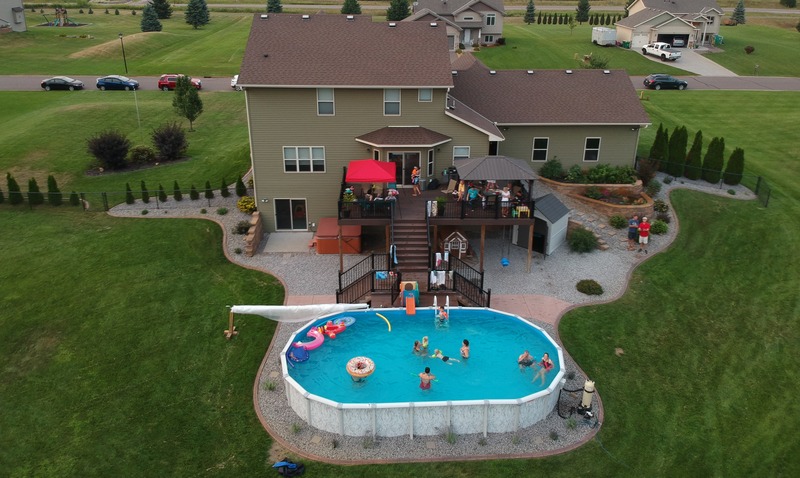 The larger you want your pool to be, the more you can expect to spend--but also, the more space you'll have to swim with your family and enjoy the great outdoors throughout the summer! Thankfully, once you choose you the pool model you prefer, you can compare the pricing of the different sizes and see that its is not very expensive at all to go for the increased swim space. Depending on the model, this can be as little as $50-$100 to go up a size! There are plenty of cheap above ground pool kits on the market every year. Unfortunately, those kits aren't designed for longevity, especially with more playful families. In many cases, they might not even last the summer while in other cases, they'll need to be replaced regularly--and you may find yourself dealing with maintenance challenges on a regular basis. For this reason, Royal Swimming Pools, only carries safe, durable, and time-honored Above Ground Swimming Pool brands. While different models of these brands will have different durability levels, they are much more likely to stand the test of time with proper maintenance and care. Do you want a large deck to go around your pool, or do you already have a space that you can use? The reason being, relaxing by the pool is sometimes just as enjoyable as relaxing in the pool. For that reason, you'll want chairs or possibly loungers beside the pool. For many pool owners this ends up being a deck so they can sit back and enjoy the look of the water or watch their children instead of just a pool wall. Keep in mind though, the more decking you build, the more expensive it can be. A large, expansive deck can significantly add to the price of the pool while t a smaller deck which simply allows you space to get in and out of the pool may be much more affordable. Do you have small children at home? 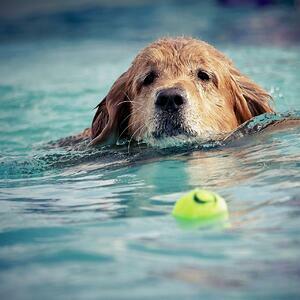 Pets--or neighborhood children--who might need to be kept out of the pool when not supervised? As you're deciding what you want for your pool, think about safety features: a surface alarm that will sound if the surface of the water is broken (for example, if a child or pet falls into the water), a fence that will help keep out anyone who isn't supposed to be in the pool, or a pool cover that will help keep curious pests (or people) out. Make sure you have considered which safety elements you plan to use so you can factor them into your initial budget. Did you know that Royal Swimming Pools actually does above-ground pool installations? That's right, even though we sell our pool kits and accessories nationally through our website, we started out as a local pool company in Memphis, Tennessee where we're still doing installations to this day. 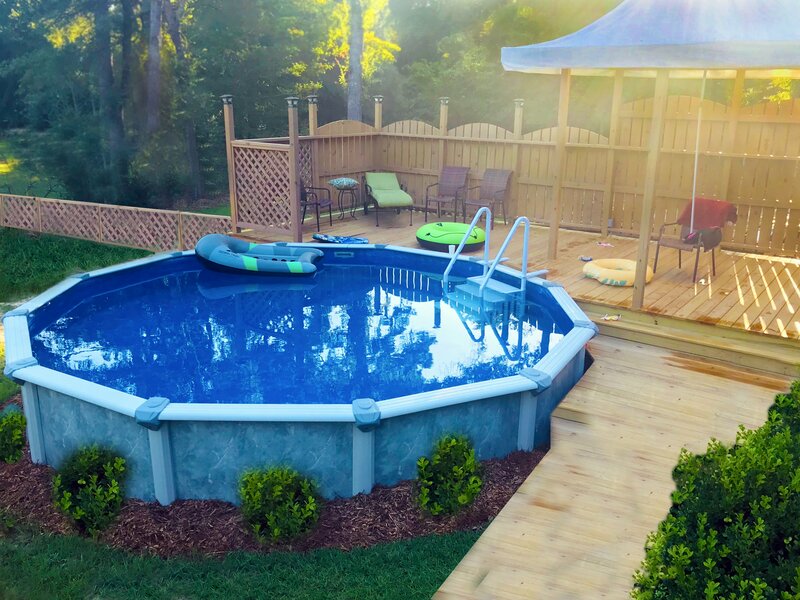 So if you're looking for a breakdown of how much it really costs to install an above-ground pool, here's a basic breakdown of our pricing in Memphis. While our prices are fairly standard when compared nationally, overall cost can vary depending on location and project requirements. If you already know where you want the pool to go, this shouldn't cost you anything. But if you need someone on a team to come out and determine the best backyard placement for your pool, you will incur some additional fees. Again, these are largely dependent on the time it takes to travel to you, but will generally run between $100-$200. Since we're located in Shelby County, we generally service the entire local surrounding area, including Memphis and its immediate suburbs for no additional travel cost. However, depending on how far we go out, you may have to pay additional fees, anywhere from $65-$195. This is also standard practice for pool installation companies willing to travel outside their intimidate area to assist with an install. As with any major construction project, you will very likely need to acquire a permit for the installation. This can be taken care of on your own, though most pool installers can also help with the permit process for an additional fee for the time and cost of obtaining everything on your behalf. In our case, a permit in Shelby County obtained by Royal Swimming Pools will cost a new pool owner an additional $195. Keep in mind that you can obtain permits on your own for less should you choose. 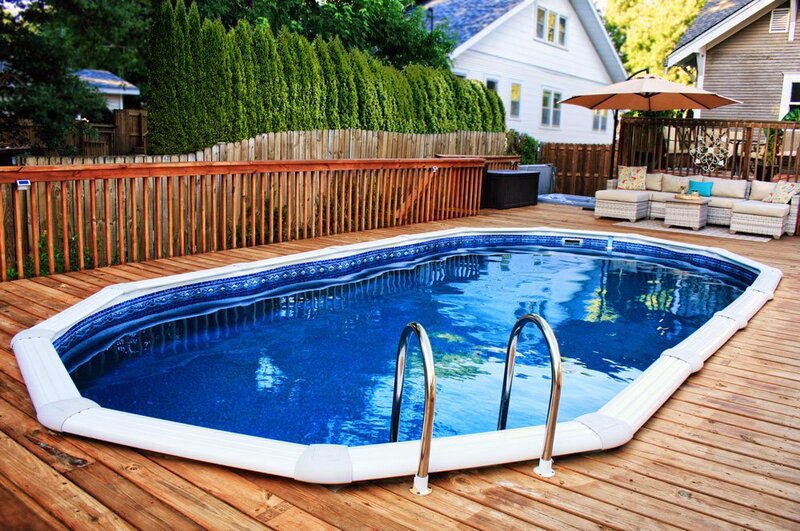 Depending on the size of your pool, you can expect to pay a set amount as your base price. For a standard 24' above-ground swimming pool, you'll be looking around $795 for pool and equipment installation. Additional assembly fees may be required for items such as ladders, steps, or other external add-ons. These are generally very easy to assemble on your own as the pool owner and are not typically included in the initial installation cost. *Please note that the prices listed are current as of April 2019 and are subject to change. For up-to date prices or to compare the cost of installation for different sizes and shapes, view our Above Ground Installation Costs here. Carefully consider what size pool you really need to reach the goals you have for owning a pool. What will you be using the pool for? Who will be using it? Pay attention to those details as you're considering what elements are really needed for your family. The holy grail of saving money when installing a new pool is to but back on the professional labor. Instead of bringing in a pool company, who can charge just as much for the labor as you did for the pool itself, consider putting in your above-ground pool on your own. For the cost of a few hours, you can have the perfect pool for a fraction of the price. Our above-ground pool kits are designed to be easy to set up and install, as long as you can follow basic directions (and ideally have a helper or two). Whether it's a back yard redesigned to make your pool the focal point or a fun way to burn off plenty of energy, put together your dream setup in segments. 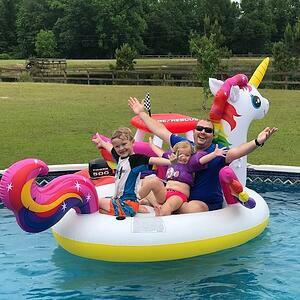 You'll have a lot of fun in your pool with just the basics in place, so don't feel as though you have to be able to afford the whole setup immediately in order to get started. Wait a little while to add that massive wrap around deck, or those perfect Instagram worthy floats, or the water volleyball game. Sure, it may be more expensive up front to invest in a high-quality above ground pool kit. 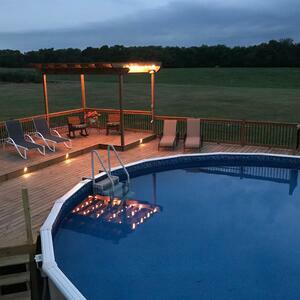 The cost of your above ground pool, however, doesn't just include the immediate expense. It also includes the amount you'll spend maintaining it over time. If you plan to enjoy your pool for more than one or two summers, we strongly suggest going with a higher-quality pool kit than what you might find at your local big-box store. While you're thinking about maintenance, you should consider what will be necessary to keep your pool in great condition over time. If you really want to save, take the time to care for your pool. When you take care of your pool, you'll spend less on it overall than you would if you had to replace it or items that have become faulty due to poor maintenance. So What Does an Above Ground Pool Really Cost? When you choose an above ground pool kit that is tough enough to withstand years of summer play, you can start with a base price as low as $1,200. At the other end of the spectrum, for a an extra-large deluxe saltwater pool with all the extra fixin's, can run as much as $12,000. Make sure, as you're considering your price, that you've added in the potential cost of installation (unless you plan to take the DIY route - something many of our customers do). Also consider the cost of landscaping and any other features that you'll want to add to your pool: decking, a fence, and any other elements you want to add. Though remember, those items can always be added later in phases. If you're ready to start your new above ground pool project and you need more information about the package that's right for you, contact us! We can assist you with picking out the perfect pool for you and pairing it with the correct equipment as well as walk you through how you can save big by doing all or part of your own labor. Either way, we're happy to help you obtain your favorite new space with your own above ground pool.